There's a little Sundance film from last year that seems to be gaining quite a bit of buzz this year. It's called Sunshine Cleaning and it stars Amy Adams and Emily Blunt. Those two beautiful ladies might be why it's gaining so much buzz -- hell, that's why I wanted to see it in the first place, too. Cinematical has debuted the final poster for the film, which officially hits theaters starting on March 13th. But here's the bottom line -- it look cute and entertaining in theory, but it's really not that great. The directing is uneven, the writing is just plain bad, and even Adams and Blunt don't make it any better. My suggestion -- Just skip it. The only semi-good news is that Michael Penn is writing a new score for the film. Otherwise, watch the trailer if you haven't seen it yet, enjoy the poster, but forget about this film as fast as you can. Sunshine Cleaning is directed by New Zealand-born filmmaker Christine Jeffs, of indie films Rain and Sylvia previously. The script was written by first-time writer Megan Holley. This first premiered at the Sundance Film Festival last year and was later picked up by Overture Films for distribution here in the US. 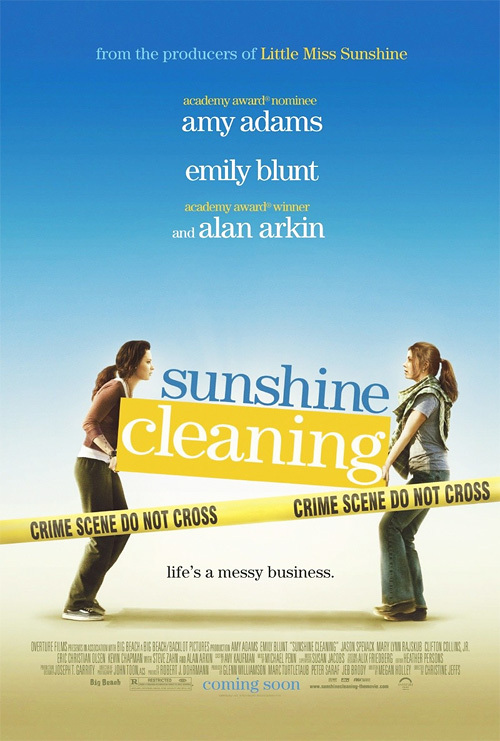 Sunshine Cleaning arrives in limited theaters starting on March 13th, 2009. Watch it at your own risk. I agree, it doesn't look to great. But "skip it" sounds like bad advice to me. Watch it, assess it for yourself. Watch everything. Since you didn't really write anything whatsoever hinting at what it's about I guess I have to watch it now. Alex, the plot is about two girls who start a "Cleaning" business. But what they really end up doing is acting as a "Cleaner" for assassins! The poster is spot on! sunshine cleaning is about a woman whose life is going nowhere. she gets advice to start a business cleaning up crime scenes for the cops. she asks her friend to join her and it goes from there. i've seen the trailer and it looks pretty funny to me. the part where her friend sees her first crime scene was really funny. alex, i just noticed you said "skip this"? i disagree 100%. it sounds like a pretty good idea for a movie. i haven't seen it yet but i liked the trailer. i've noticed lately that if it isn't the "watchmen" or some other comic book influenced movie, you just aren't into it. you also said "defiance" wasn't very good. i've seen it and i thought that was a very well done movie. what gives? I love Emily , and i think amy + emily = AtomicBomB! !